Large (10 cm) and bright orange this is the most widely recognized of all Canadian butterflies. The wings have a thick black border with 2 rows of white spots. Males have 2 highly visible black spots on their hind wings and the black bands on the wing veins of females are much wider than the males. 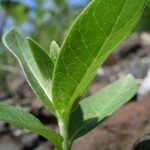 Sometimes called the milkweed butterfly, the larva feed exclusively on this plant. 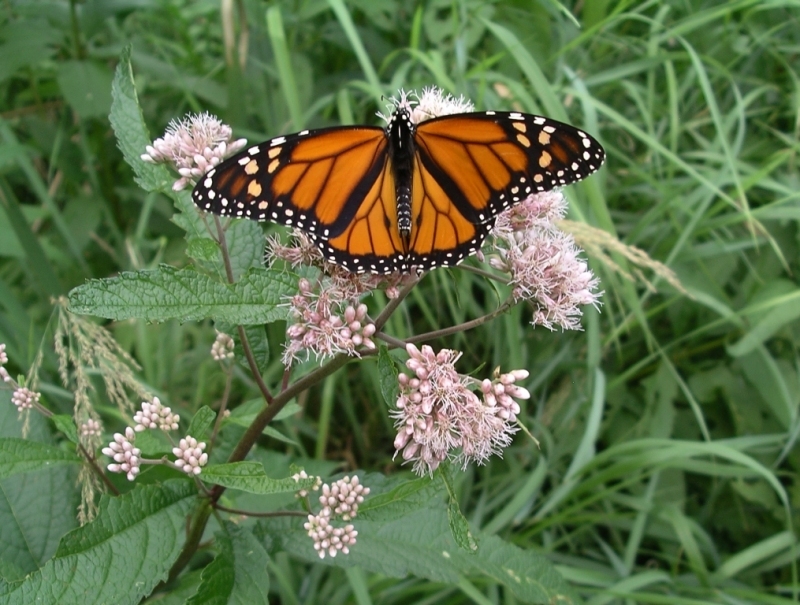 As a result, the toxins from the plant are present in the Monarch and they are poisonous to predators. Adults feed on the nectar of many flowers. Migrates 1,000’s of kilometres to over winter in one of twelve sites in Mexico. They have been found flying 1 km above the ground. Usually reach their wintering grounds by late November-December. Start migrating north to the Gulf Coast of the United States in March and early April. 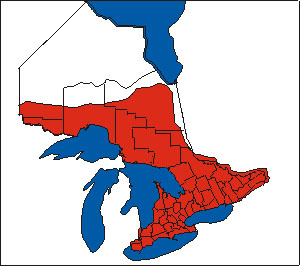 The females will lay eggs and it is these offspring that continue the journey north to reproduce in Ontario arriving usually in early June. Females lay approximately 400 pin sized eggs on the underside of milkweed leaves and will have 2-3 broods in one season. The eggs hatch 3-12 days later depending upon temperatures. Caterpillar or larva are large (5cm long) and brightly striped with yellow, black and white. They stay in this stage for around 2 weeks and then, in a couple of hours, transform into a jade and gold coloured pupa or chrysalis. Adult butterfly emerge a couple of weeks later. Start migrating south starting in early August to mid October. Point Pelee National Park and Presqu’ile Provincial Park are two locations in Ontario where monarchs tend to gather before heading across the lake. They do not reproduce on the southern journey. Will only breed where milkweed plants are present. This tends to be in open habitat, i.e. old fields, meadows and other agricultural areas. Winter habitat is forested habitat at relatively high elevation. With the winter population concentrated in only 12 sites in Mexico, they are vulnerable to natural disasters such as winter storms and changes to the forest by activities such as logging. Application of herbicide has eliminated milkweed in some agricultural areas. 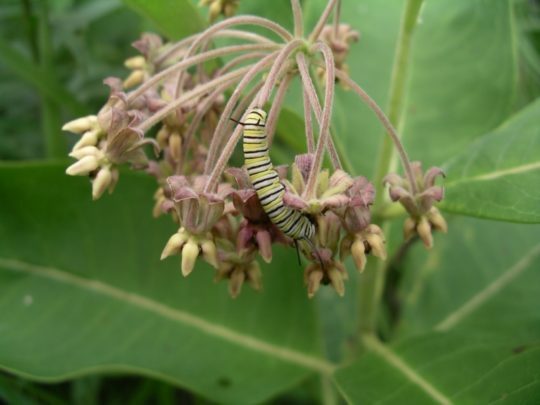 Allow milkweed to grow in at least a few locations on your property. Other flower species, such as goldenrod and asters provide nectar for the adults. Visit Monarch Watch to learn more and help out little friends.